These gadgets do much more than make sure your Amazon delivery arrives on your porch. Smart doorbells — a gadget equipped with livestream and build-in speakers that allows you to answer your door when you’re not physically around — started as an innocent way to check in on your front porch when your Amazon package was being dropped off while you were at the office. But there’s trouble brewing in suburbia. 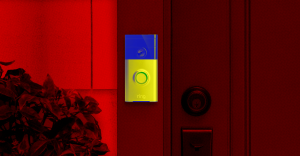 Amazon-owned smart doorbell company Ring just released an app called Neighbors that gives you the tools well beyond what is needed to check that your delivery made it to your porch. The standalone app allows you to get in touch directly with law enforcement — a local police force, or private security company — and notify them of anything fishy going on in your neighborhood, as Motherboard reports. What’s even more questionable is the fact that the Neighbors app doesn’t even require any Ring hardware. You snap a picture of that guy who picks bottles out of your neighbor’s recycling. You then upload it to a mapped out virtual network of your neighborhood. It’s all in the name of safety. Right? Neighbors isn’t the only app that does this. There’s Nextdoor as well — an app that enables you to “organize a Neighborhood Watch Group,” or quickly spread the news of a recent break-in. It’s all in good fun, of course: you can report your neighbor’s missing cat or “finally call that nice man down the street by his first name,” according to their website. But it’s pretty clearly a bad idea. We’ve seen it time and time again: handing over your personal data to profit-driven mega-corporations can have some pretty negative consequences. Doing so can result in companies tracking where you are at all times, live-streaming your children’s most private moments, and even altering the course of presidential elections. Getting law enforcement involved makes things much more complicated. It’s one thing if you choose to allow government surveillance Amazon Echoes to listen in on conversations in every room of your house. Making (what are very likely to be) ill-informed calls to the police on who has what kind of intentions on your street is something entirely different. Escalating normal neighborhood goings-on in to involve law enforcement becomes a whole lot more dangerous when everyone is sitting around with their finger on the panic button. It’s pretty much guaranteed to get some innocent people arrested, or worse. This isn’t just paranoia — these scary effects are already happening. As BuzzFeed reported, the Nextdoor app has become a cesspool of racial profiling. Even the app’s efforts to curtail racial profiling with a neat, little algorithm back in 2016 couldn’t stop the overwhelming torrent of ignorance. Splinter describes users warning the neighborhood of “sketchy” young African-American guys in hoodies and black beanies. The benefits of smart doorbells seem to be limited to an alleged decrease in burglaries — that is, if the Los Angeles local news is to be believed. But those pros don’t outweigh the cons. In a world in which minorities experience violence at what seems like the slightest excuse, the proliferation of smart doorbells and slap-shod digital neighborhood watch portends a dark future.